The Whelen Engineering All-Star Shootout is just two days away, marking the official start to a jam-packed weekend of racing at New Hampshire Motor Speedway. The fourth annual invitational event, pitting the top drivers in the NASCAR Whelen Modified Tour, will drop the green flag on Friday, July 14 at 2:15 p.m.
00 Ron Silk Norwalk, Conn.
07 Patrick Emerling Orchard Park, N.Y.
2 Doug Coby Milford, Conn.
3 Rowan Pennink Huntingdon Valley, Pa.
4 Max Zachem Preston, Conn.
5 Kyle Ebersole Hummelstown, Pa.
6 Ryan Preece Berlin, Conn.
7 Donny Lia Riverhead, N.Y.
11 Andy Seuss Hamstead, N.H.
16 Timmy Solomito Islip, N.Y.
44 Bobby Santos Franklin, Mass. 46 Woody Pitkat Stafford, Conn.
51 Justin Bonsignore Holtsville, N.Y.
58 Eric Goodale Riverhead, N.Y.
77 Ryan Newman South Bend, Ind. 82 Ted Christopher Plainville, Conn.
85 Todd Szegedy Ridgefield, Conn.
89 Matt Swanson Acton, Mass. 97 Bryan Dauzat Alexandia, La. 99 Jamie Tomaino Howell, N.J. The All-Star Shootout has a 30-minute time limit and will feature two segments with a mandatory caution at Lap 20. The race will be restarted by the car’s last completed green flag lap except for those cars involved in a random number selection that will determine the number of cars to be inverted for the restart. 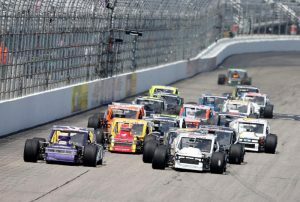 The mods will also be on the track Saturday, too, as the NASCAR Whelen Modified Tour will have the first of two points races, the Eastern Propane & Oil 100. Doug Coby is the reigning July race winner, which will be the first race on a Tripleheader Saturday of racing that also includes the NASCAR XFINITY Series Overton’s 200 and the NASCAR K&N Pro Series East United Site Services 70. For more details and ticket information on events at New Hampshire Motor Speedway, or to purchase tickets to the July Overton’s 301 or September ISM Connect 300 Monster Energy NASCAR Cup Series weekends, please stop by our Fan Relations office, visit the speedway website at www.nhms.com, or call (603) 783-4931. How is the Whelen Modified Tour’s Most Popular Driver left out of this race? That’s OK, she’ll be in the event soon enough, plus I can’t make it on Friday. So go Stolimoto! Bottoms up boys! Based on previous champions, race winners from 2016, and then points from 2016 until a full field of 20 cars. Liz, in racing and government, there are stark differences in the popular vote and actual performance. I’m thinking Max Zachem is going to have a good race. I hate it when family stuff happens on Loudon Saturdays! Good luck and safe race to all, especially the Zachem and Santos teams!